The badge is a symbol of readiness at all times to render service to Queen and country, and to former comrades. The wattle is symbolic of Australia. The leek, the rose, the thistle, and the shamrock are symbolic of, and represent, the link with Wales, England, Scotland and Ireland respectively. It is a time-honoured emblem, one that has been worn with a deep sense of pride by the most revered in our land, and one that glorifies the coats of all privileged to wear it. 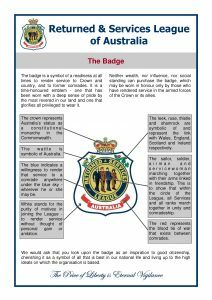 Neither wealth, nor influence, nor social standing can purchase the badge, which may be worn in honour only by those who have rendered service in the Armed Forces of Australia and her allies. The blue indicates your willingness to render that service to a comrade anywhere under the blue sky wherever he or she may be. Depicted in the centre of the badge, and encircled by the name of the organisation, you will see a sailor, soldier, an airman and service woman marching together with their arms linked in friendship. This is to show that within the circle of the League, all services and all ranks, march together in unity and comradeship. It challenges RSL members and those who see it to good citizenship, cherishing it as a symbol of all that is best in our national life, and living up to the high ideals on which the organisation is based. 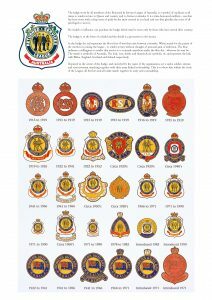 For further information, please see these downloadable resources, courtesy the RSL.